Simply press and stick under the corners or edges of any size rug. --They grip without glue and won't leave a sticky residue. Washable and reusable. We will try our best to reduce the risk of the custom duties. 4 Pairs of Anti Skid Grippers ( 4 pcs rug grippers 4 pcs removable sticky tapes). Gently remove grippers form floor and carpet. Type: Anti Skid Grippers. This anti skid gripper help stop rug corners form curling, and keep your rugs looking neat and tidy. Item Description Condition: 100% Brand New, high quality Color: As picture show Material: Polyurethane Size: Approx. 150*70*2mm Package Included: 1pcs Conversion: 1 inch = 25.4mm or 1mm = 0.0393 inch Pictures: Due to the difference between different monitors, picture may not reflect the actual color of the item. We guarantee the style is the same as shown in the pictures, but not the same performance on different bodies as on the model. Thank you for your purchase. 10PCS X Reusable Ultra Sticky Gripping Pads. - Stick to install, requireno tool. Cut to fit any surface. 24/7 Service ?. - Double sizedtransparent sleek design. Feature: Condition : 100% Brand New And High Quality Prefect Fashion And Useful. It is a great for your lover , family and friends. Make your party lift more pretty fun convenient with your decorations/items. Colors : Black Material : Polyurethane Size Approx: 150*70*2mm Packaged : 1Pc Conversion:1 inch=25.4mm or 1mm=0.0393inch Check out my other items ! If you love my items, please to my homepage and click “ Follow ” . Notice : 1.Please allow 1-3mm error duo to manual measurement , please make sure you do not mind before you bid . 2.The colors may have different as the picture display , please understand . I hope you have a good shopping experience !. 4 x Rug Grippers. Due to the light and screen setting difference, the item's color may be slightly different from the pictures. Material: Polyurethane. Size: 150mm x 75mm x 2mm/5.91" x 2.95" x 0.08" (Approx.). Stop rug corners from curling. Works on any floor surfaces hardwood, tile Lino etc. Convenient and just press to stick on. We will do our best to solve your problem. Stop rug corners from curling. Works on any floor surfaces hardwood, tile Lino etc. Convenient and just press to stick on. Size:15.5cm x11cm/ 6.1" x 4.13". We will do our best to solve your problem. With a strong anti-skid, breathable, antibacterial and other characteristics, can be spread in a variety of materials at the bottom of the carpet. 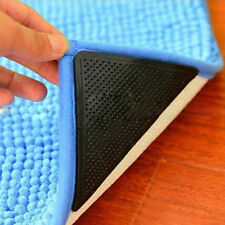 Usage: such as tool cabinet mats, vase mats, fruit mats, cup mats, placemats, car mats, car trunk mats, cell phone mats, table mats, mouse pad etc. It is a great gift for your lover, family and friends. Material: Polyurethane. We promise to try our best to safisfy you! High product quality. 1 x Non-Slip Mat. Versatile PVC construction - durable, waterproof, anti-slip, and shockproof. The thick material allows for heat insulation from various sources. Material: PVC. Premium thickness (30cm x 120cm size only) - suitable for heavy duty work loads. 1 x 4PCS Reusable Rug Carpet Mat Grippers. This non slip silicone grip is strong viscous force, can tightly stick to the ground, carpet, to make them not slide. 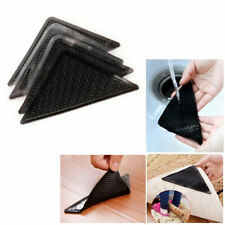 Very convenient, can be use on mat and carpet, firmly fixed so that it is not easy to move. With a strong anti-skid, breathable, antibacterial and other characteristics, can be spread in a variety of materials at the bottom of the carpet. -Uses: such as tool cabinet mats, vase mats, fruit mats, cup mats, placemats, car mats, car trunk mats, cell phone mats, table mats, mouse pad. Make you rug non slip. Work on hard floorings, including tile ceramic, hardwood, laminate, etc. Ideal alternative to rug pad. 2 【Strong Stickiness】These carpet grippers can adhere to the surface of virtually any dry object and have strong stickiness so they can keep your carpet or rug left. Winter Car Steering Wheel Cover/Universal Soft Warm Plush Brown Covers Jian. Natural Long Handle Body Brush Massager Bath Shower Back Spa Scrubber New Jian. Clipper Comb Hair Cuts Black Plastic Barber Comb Hair Salon Barbers Tool jian. Trending at C $7.72eBay determines this price through a machine-learned model of the product's sale prices within the last 90 days. Colors : Black Material : Polyurethane Size Approx: 150*70*2mm Packaged : 1Pc. Quantity: 4pcs. Easily be glued under any rug. The side facing the floor features tiny suction pores. The rug tape adds extra comfort underfoot owing to the slightly bouncy nature of suction technology. Rugs and mats are a popular household accessory, whether you have smaller kitchen and bathroom mats or larger area rugs and runners. Various accessories, such as rug pads and rubber grips, can help increase the functionality of the rug. They keep it in place and therefore keep both the rug and your floors in good condition. How do you cut padding for an area rug? Many padding supplies can be bought in a large roll that must be cut to fit the size of your area rug. There are some tips and tricks to ensure that the process goes smoothly. Measurements: Measure both the size of your area rug and the padding to determine how much material you will need. The pad should be just slightly smaller than the rug to ensure that it is not sticking out from under the edge. Cutting: Regular scissors can be used for thinner rug pads, but thicker varieties may require a more durable blade. Cut the material on concrete, plywood, or another durable surface to avoid damage to your flooring. How do you clean a rug pad? Both the rug and rug pad can collect dirt and debris that may come from spills, hair, shoes, and more, so it is important to occasionally clean the rug pad to remove dirt and odors. Vacuum the carpet with the rug pad underneath, then shake it out outside. The pad can be cleaned with a mixed solution such as vinegar and water or baking soda mixtures and scrubbed with a sponge or cloth. Let the rug pad fully dry before putting it back on the floor. How do you put rug grips on? Most grips are small pieces made of silicone or rubber that fit under the corners of the rug to keep them from sliding on linoleum floors, hardwood floors, or tile floors. These rubber pieces generally stick without adhesive and can be simply pressed onto the underside of the carpet. They can be removed just as easily and rinsed off and reapplied. 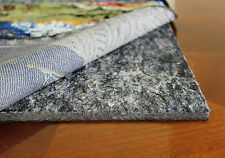 What type of rug pad do you need? 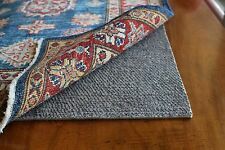 Rug pads can make a large difference in your home as they can keep the rug from slipping, make it more comfortable and padded, and keep the carpet as well as the hardwood or other flooring in good condition by preventing scratching from the fibers and furniture legs. The type depends on your desired use. Cushioning: If you want to add more cushion to the carpet, a thicker rug pad may be needed. Thicker varieties can go well with hard surfaces such as tile and wood floors. Grips vs Pad: A full rug pad may be needed to protect the entire floor under the rug if you have hardwood floors, but small grips can be useful on durable floors and are easy to apply.